Amberina Glass Rose Bowl, c. 1900. 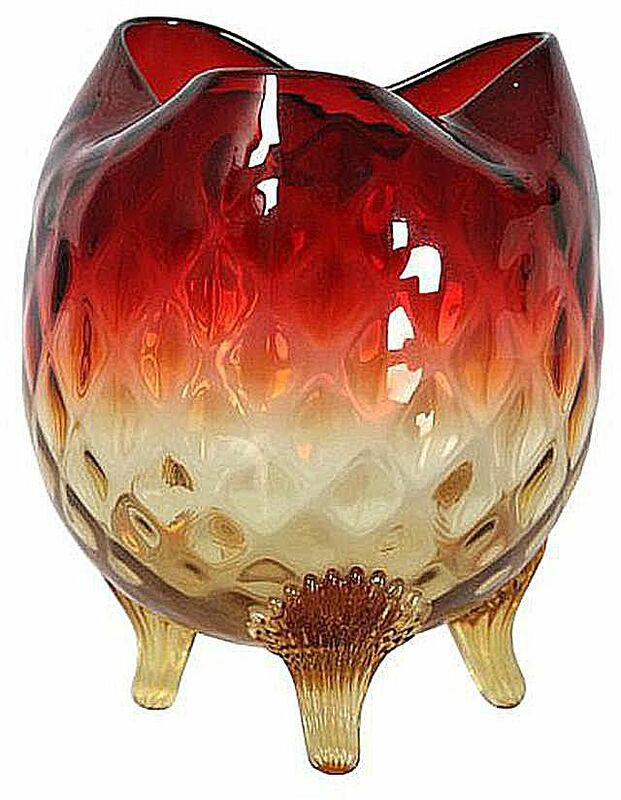 Amberina is the name given to a type of glass with gradient color that starts out red at the top of the piece and changes to amber at the bottom. Variations in hue range from lighter shades that look almost pastel pink and yellow to rich, deep tones of ruby red and amber. A number of different companies manufactured this type of glass beginning in the late 1800s and continuing into the early 20th century. It was originally developed by New England Glass Company in 1883. “The earliest Amberina has a flint quality and an excellent resonance when tapped lightly,” according to The Collector’s Encyclopedia of American Art Glass by John A. Shuman III. Libbey was another company making Amberina around 1900, and they revived the color in 1920, according to Shuman. Limited quantities were made, however, even though the color and quality were on par with earlier examples. Some of these pieces, like their cut glass, are marked “Libbey” in script letters. These marks can sometimes be faint on clear glass but a bit more legible on the Amberina pieces. All the popular glass wares of the day were made in Amberina ranging from water pitchers and tumbers to castor sets to baskets, compotes, and vases. The shading in the glass was achieved by small amounts of gold being added to transparent amber glass (much in the same way cranberry glass is made). The top portions of the glass objects being crafted were then cooled and reheated to get the shadings from red to yellow. Occasionally the colors are reversed with the red at the bottom of an item, but this is not commonly found. Blown glass patterns in Amberina were made with the assistance of molds including swirls, ribs, thumbprint, and quilted designs. They have a pontil mark (a kind of scar) on the bottom of the piece indicating they were made in this way. Painting on Amberina glass looks like enameling at first glance but it is not as durable. The paint was made using a mixture of copper oxide and yellow ochre, according to Shuman. It was fixed with a high temperature, cooled and painted again before being reheated. In pieces where the painting has worn away, iridescent streaks will be present when examined closely. Values are not as high for these pieces as if they were in original condition. As a way to produce the look without the high cost, Amberina was also made used the “flashed” process. A base piece of solid amber glass was partially coated with a glass mixture containing gold; this produced a red color. These pieces have a more distinct line where one color ends and the other begins rather than the natural graduation of coloring in pieces that were more costly to produce. These flashed items are not as desirable to collectors, and the value is lower in comparison to true Amberina wares. Collectors quite often find molded glass novelty pieces, also known as “whimsies,” marked on the bottom with a D inside a heart in colors referenced as Amberina. Since Crystal Art Glass Company wasn’t founded by John and Elizabeth Degenhart until 1947, these pieces date much later than original Amberina. They sometimes have several layers of coloring or a more swirled effect to them in comparison to older pieces as well. While collectible in their own right for what they are—novelty glass—they shouldn’t be confused with older Amberina pieces.